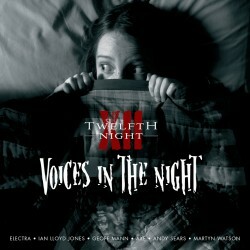 Voices in the Night is the band’s 9th archive CD-R. The double CD features everyone who sang with the band from 1980-97. It includes many previously unreleased studio recordings and some extremely rare live recordings too. It was first released on CD on the Cyclops label in 2007. Tracks 1-3 recorded with Electra McLeod at Arny’s Shack, Bournemouth, August 1980. Track 4 recorded with Ian Lloyd-Jones at Woodcray, Wokingham, March 1981. Track 5 recorded with Geoff Mann at Matinee Studios, Reading, March 1982. Tracks 6-7 recorded with Geoff Mann at CBS, London, July 1983. Track 8 recorded with Nigel ‘Axe’ Atkins at John Verity’s, Bradford, October 1983. Tracks 9-11 recorded with Andy Sears at Matinee Studios, Reading, January 1985. Track 12 recorded with Andy Sears at Thin Ice, Maidenhead, March 1994. Tracks 13-16 recorded with Martyn Watson at Strand, Chiswick, February 1987. Tracks 1-3 recorded with Geoff Mann at the Marquee, London, March 1983. Track 4-6 recorded with Andy Sears. Basic tracks recorded December 1985-January 1986, Jacobs, Farnham, Surrey; overdubs recorded January-February at Rooster Studios, Shepherd’s Bush, London. Tracks 7-11 recorded with Martyn Watson, Westar Studios, Southall, February 1987. Track 12 recorded with Geoff Mann & Andy Sears at the Marquee, London, October 1987. All the tracks on Disc One are studio recordings – previously unreleased on CD – and feature in chronological order all the vocalists who sang with us. Further details of all the tracks/singers can be found on Brian’s sleevenotes – a sample of which are included on this page. Disc Two the ‘live’ CD gathers together some interesting rarities featuring three of Twelfth Night’s vocalists: Geoff Mann, Andy Sears and Martyn Watson. Ian Lloyd-Jones and Axe only figured very briefly in Twelfth Night history (their only recorded contributions can be found on the disc one) and although some live recordings featuring Electra do exist, sadly they are not quite good enough quality to release. Most of these bonus tracks were recorded live, in concert or in rehearsal. The exceptions are Andy’s tracks, which were done at Rooster Studios, during the recording of the Virgin album. We’ve included these working mixes, as they show how the tracks sounded before the solos, effects and final vocals were added, and because they feature a (mostly) live vocal performance. The first two tracks are the remaining encores from Geoff’s final Marquee show, never issued on a Twelfth Night CD before, while the third track is a real rarity, being the only recording we have of ‘Not on the Map’. Rearranged, and with different lyrics, the track later became Blondon Fair – released on the B-side of the Shame single. Martyn’s songs are from a special performance in front of various personnel from Virgin Records and ‘Hit & Run’, the band’s management company, at Westar Rehearsal Studios, London. As the sound quality is not pristine, we’ve done our best to clean up the recording as much as possible. Hopefully the rarity of these tracks will go some way to compensate for any lack of hi-fidelity sound! This compilation ends with a unique version of Love Song recorded, where else, but the Marquee. Fittingly, this version features all three vocalists that appear on this bonus disc, although only two of them actually sing! (Martyn plays bass). Poignantly, this was the last time that Geoff sang with his old friends and band mates. Unfortunately the tape ran out before the end of the song, so in order to complete this historic recording the closing bars have been spliced on from the best available audience recording.